College graduates eager to begin their careers in teaching grades 1-6 face one final hurdle, passing their certification exam. Missouri’s Educator Gateway Assessments (MEGA) program employs the Elementary Education Multi-Content (007-010) exam to measure the knowledge of educator candidates prior to granting them licensure. Which subjects does the MEGA EE Multi-Content Exam cover? Prepare with our MEGA Elementary Education Multi-Content Study Guide and Practice Questions. Print or eBook. Guaranteed to raise your score. Get started today! The certification test for Missouri elementary schools consists of four one-hour subtests, each with 40 multiple choice questions: 007 English Language Arts, 008 Education Mathematics, 009 Science, and 010 Social Studies. All subtests are computer-delivered. What is a passing score on the Multi-Content test? Candidates for elementary school certification in Missouri must pass each of the four subtests with a score of 220 on a 100-300 scale. What are the time limits and fees for the Multi-Content exam? One hour is allotted to complete each subtest. Fifteen-minute breaks are permitted when three or four subtests are scheduled on the same day. Immediately prior to testing, candidates receive instruction on the computerized assessment program. When only one subtest is scheduled, the fee is $39. Two subtests taken at one sitting cost $65. The fee for three subtests taken on one date is $90. When all four subtests are taken on the same day, the fee is $110. How do I register for the MEGA Elementary Education Multi-Content Exam? Visit the MEGA website to register and find testing dates, sites, and policies. Candidates seeking to add or transfer teaching certifications should consult the Missouri Department of Elementary and Secondary Education. MEGA Elementary Education Multi-Content Flashcards. 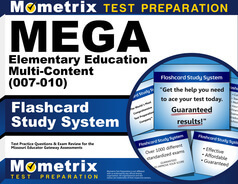 Proven MEGA test flashcards raise your score on the MEGAtest. Guaranteed. Pearson Vue operates and staffs the testing sites for the MEGA Multi-Content Exam. All four subtests of the elementary education certification exam are available by appointment in Missouri and nationwide. Subtests can be scheduled on the MEGA website. Registration is good for one year, provided that candidates pay their fees and appear at the testing site when scheduled. Test takers must bring a government-issued photo ID to their test site, and the name and address on the ID must match the candidate’s registration information. No electronic devices or personal study materials are allowed at the testing site. To assist those taking the MEGA Elementary Education Multi-Content mathematics subtest, a standard four-function calculator is integrated into the computer test program, and Pearson Vue administrators provide test takers with a formulas sheet. MEGA emails test scores to candidates within two weeks of the testing date. Test scores remain available for two years. Are special arrangements available for test takers with disabilities or non-native English speakers? Those who have a documented disability or whose primary language is not English may request additional testing time on the MEGA Elementary Education Multi-Content exam by submitting a completed Alternative Testing Arrangements Request form with their registration. The request must include a professional’s evaluation of the extra time needed by the candidate. Test takers born outside the United States should include a copy of their Visa or citizenship status. 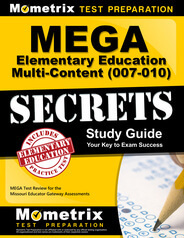 How do I study for all four subtests on the MEGA Elementary Education Multi-Content (007-010) Exam? Mometrix provides a wealth of test information and practice at a reasonable price to pull you through the Multi-Content exam and put you in front of your own classroom before another school year starts. How about a free sample? Mometrix Academy’s online videos help you visualize the multiple-choice questions you will see on the Multi-Content subtests. After viewing a few of videos, you may notice that many of the questions answer themselves. If you pay attention to the wording, you will discover that the wrong answers do not respond directly to the question. How can you sharpen your skill at sizing up the clues contained in test questions? The Mometrix MEGA Secrets Study Guide, available in print or e-book formats, provides plenty of practice tests as well as insights that will stay with you throughout your career. You will learn (and teach your own students) how to study for a test, how to overcome procrastination and test anxiety, and how to focus your mind and pass your certification exam on the first try. What if study skills are less of a challenge for you than memorizing facts, formulas, abstract concepts, and names of people and events? Repetition cures this problem, and Mometrix Flashcards put the cure in the palm of your hand. Each flashcard is printed with a typical question from one of the subtests on one side and the correct answer on the back. You can stash the flashcards in your lunch bag, flip through them during work breaks, and review a dozen questions and answers while you are stuck in traffic. Flexible but durable, flashcards are effective for individual or group study because they are fun to use. Give them a try!